Native to Madison County, FL for over 30 years, Ben has spent countless hours in the woods and on the rivers of North Florida, giving him a vast knowledge of the outdoors. Ben has been selling real estate since 2005, from residential properties in historic downtown Madison, to vacant farm land, to river lots & hunting acreage, to commercial hot spots and anything in between. As an avid outdoorsman, Ben is greatly familiar with the area, the terrain, land values, wildlife & hunting camps, but also spends much time listing and showing residential, recreational & commercial properties. Having this knowledge in the local real estate market, he has consistently been one of the top producers in this area. 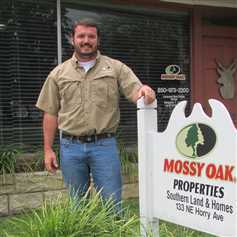 In August 2015, Ben stepped out on his own and opened the Mossy Oak Properties Southern Land & Homes office. Our office is located in downtown Madison, centered in the historic district and easily accessible to the citizens of our community and visitors alike.